The Washington Capitals came crashing back down to earth tonight in a 4-2 loss to the Lightning in Game 3 of the Eastern Conference Finals, shrinking the series lead of these briefly unbeatable-looking Caps down to 2-1. The Lightning came out with the level of intensity you’d expect from a team down 2-0 on the road, but the Capitals seemed caught off guard. 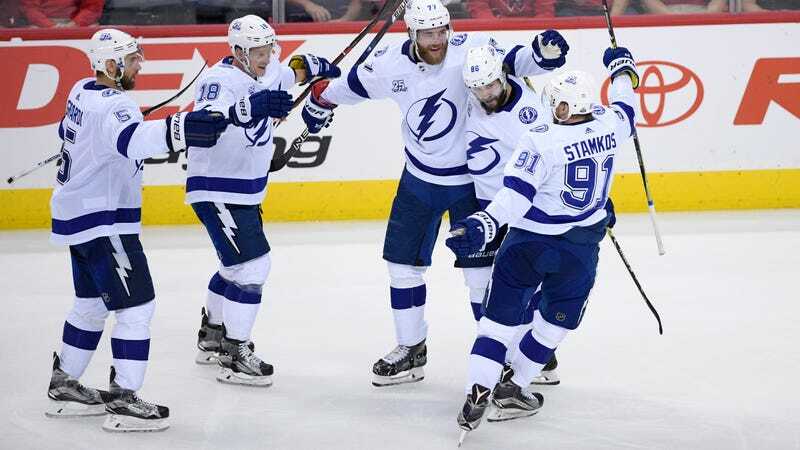 The premier Tampa cohort of Steven Stamkos, Nikita Kucherov, and Victor Hedman completely outclassed everybody else on the ice, combining for the game’s first three goals and sticking Washington into a hole they couldn’t dig out of. In their first two powerplay opportunities—midway through the first period and at the beginning of the second—the Bolts scored symmetrical goals on bullet one-timers past Caps goalie Braden Holtby. A pretty pass by Kucherov gave Hedman the easy score (his first of the playoffs) for the 3-0 lead, and any hope from Brett Connolly’s goal for the Caps was soon snuffed out by Brayden Point. Evgeny Kuznetsov’s effort to cut the Tampa lead to 4-2 with three minutes to go was only too little, too late. The Lightning dominated, and they’ve swiftly made this series a competitive one. But only the youngest and most naively optimistic of Caps fans would have truly believed that, after just two wins, the path to the Stanley Cup Finals became easy. The Lightning—a team that might be the scariest in the league when their offense is firing at 100 percent—weren’t going to give anything less than their best shot tonight, and the Tampa team that showed up in Game 3 should be much closer to the one that’ll stick around for the rest of the series than the Lightning we saw in Games 1 and 2. Now the challenge falls back on the Capitals to prove they can consistently match their talented opponents.